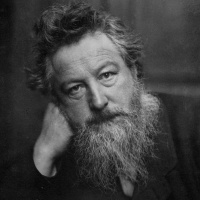 William Morris (March 24, 1834, Walthamstow, UK, to October 3, 1896, Hammersmith, UK) was an English artist, part of the late Pre-Raphaelite generation, a designer, an art theorist, a poet, a translator and a political activist. He made a significant contribution to the revival of English textile production and developed the idea of synthesis in art, which later became the basis for modernity in many countries. 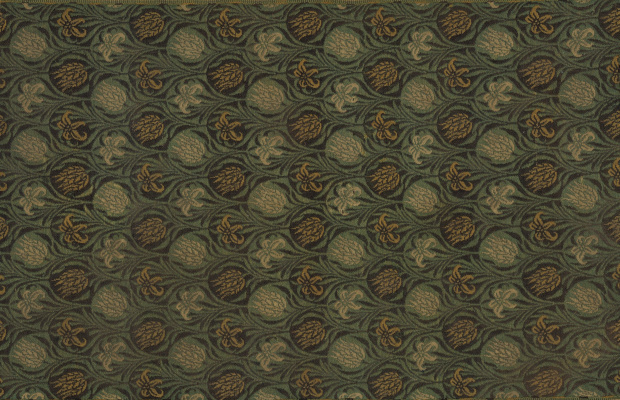 Attributes of His Works: Morris' creativity was incredibly versatile. He expressed himself in painting, design, and a variety of crafts, which supported his business Morris & Co. The main idea of his work was an appeal to the past, a search for meaning in each image, handmade art, and a disavowal of mechanization. William Morris was born into a wealthy English family in Walthamstow County, which is today a suburb of London. In his childhood, he was attracted to everything manmade and he had many hobbies: fishing, gardening, exploring forests, reading extensively, and admiring the architecture of old churches. He was most of all interested in the Middle Ages and the romance of knightly adventures. William Morris later said that his childhood hobbies and impressions had a big impact on his future life. His studies began in college at Marlborough, a time he later recalled with horror, being ridiculed by his fellow students and finding the lessons very boring. At the same time, he always admired the surrounding monuments of architecture and developed a respect for Anglo-Catholicism. In 1851 he was expelled from school. The next step in his education was Oxford. William Morris was deeply imbued with the culture of the Middle Ages, having been influenced by medievalists, who rejected many current achievements and extolled the past. When choosing a profession, romantic ideas about past centuries and about the church as the center of not only spiritual life, but also education, played a decisive role. William Morris wanted to become a priest, and in the future dreamed of starting a monastery where he could pursue his education and moral improvement. While studying in Oxford, he read the works of John Ruskin, a popular critic in Victorian England. Ruskin strongly condemned contemporary art and art in general, accusing it of mechanization and a lack of a soul and real inspiration. The ideal epoch for him was the time before Raphael, when the artist carried in his works not just earthly beauty, but also spiritual meaning. The works of the English art historian impressed the soon-to-be designer, and he changed his mind and took up art. Ruskin was the ideological bearer of a new art movement for England: the Pre-Raphaelite Brotherhood. Disappointment in the Anglican Church and an understanding of the impossibility of creating an ideal environment for living in spiritual purity and chastity further brought William Morris closer to painting. During his travels, he sought out and studied medieval paintings. Once in London, Morris met Dante Gabriel Rossetti, one of the founders of the Pre-Raphaelite Brotherhood. This meeting was fateful, and he finally realized that his true path was to paint. At the same time, William Morris tried his hand at poetry. Painter and illustrator Edward Bern-Jones spoke positively about his poems, and this was the beginning of Morris’s long poetic path. The mid-1850's was the peak of industrial development in England. The country was considered the "workshop of the world," and the well-known industrial achievements illustrated its progress. However, in fact there was another side to this success—incredible technological progress was a bane to ordinary artisans, who were put out of work. And not only did they not share in the riches, they were ruined completely. William Morris, as a true connoisseur of everything old, a lover of nature and man-made artwork and an opponent of mechanization, tried to resist the advancing march of progress. He protested by organizing the Movement of Arts and Crafts, and his first step was constructing the Red House for his family under a design by Philip Webb. It was red because it was made of brick, and there were no plans at all to whitewash or plaster it, although it was a real confrontation to Victorian taste and art style. The interior layout was ascetic and practical, but all the details of the decor and interior were executed exquisitely and by hand. The living rooms alternated with workshops. It was a spectacular sign of protest, and the Red House now appears in textbooks on the history of architecture as a turning point in the architecture of England at the end of the 19th century. But still, it was just a sign, and now he had to take action to really make waves. Then William Morris and his associates—artists Rossetti, Edward Bern-Jones, architect Philip Webb and others—decide to create their own workshop for the manufacture of decorative and applied products. It was called Morris, Marshall, Faulkner & Co., "Fine Art Workmen in Painting, Carving, Furniture and the Metals." In their early years, they mostly produced stained glass for churches. Not only the men, but also their spouses worked in the new company. Their hard work and confidence in success helped them cope with the initial difficulties, and after several years the company enjoyed not only great demand, but also began setting trends. With large orders from rich customers and the production and introduction of different types of wallpaper, tapestries, carpets, and ceramics, the life of the workshop became more interesting and productive. The workshop was famous not only for its products, but also for its high prices and expensive materials available to a limited number of connoisseurs. 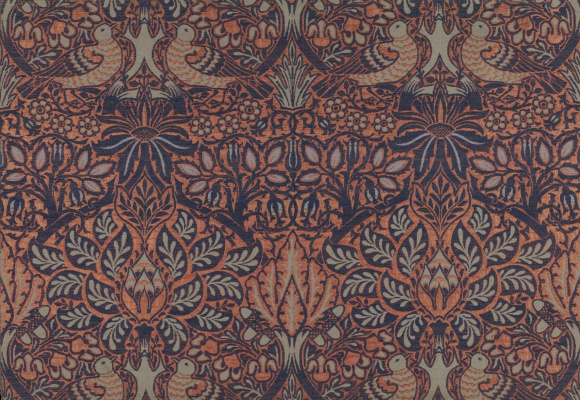 Starting in 1875, production belonged exclusively to Morris, and the company began being called Morris & Co. Over time, he started making items for people with more modest incomes. Thanks to Morris, the traditional British art of textile was revived, and it became a direct part of everyday life again. The company existed until 1940. 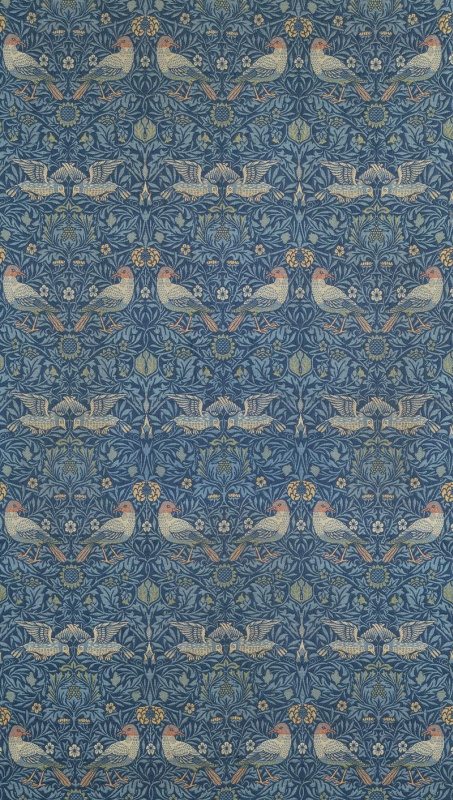 William Morris was a man with a mission. His studio did not just earn him money, but came to life from his hands. 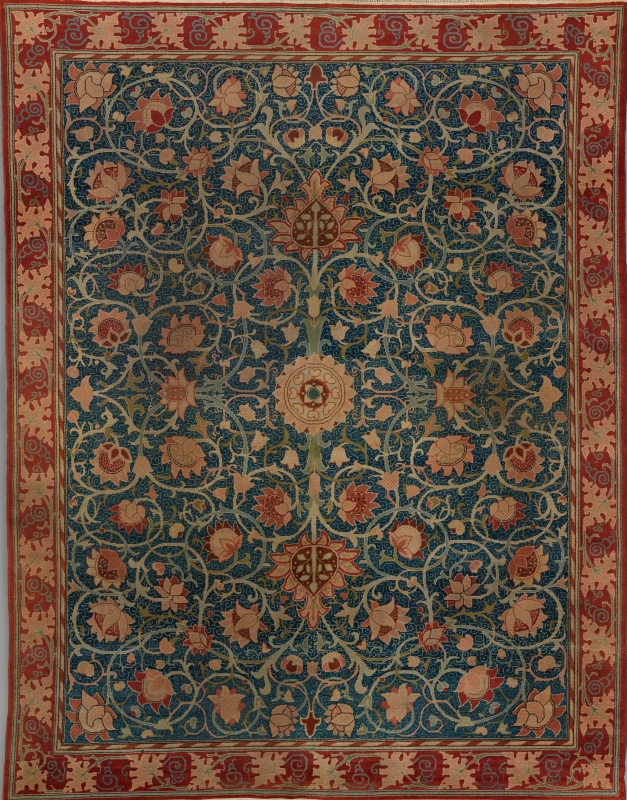 Any artist new to his craft studied independently, and he could weave carpets and made natural dyes for fabric. The idea of handicraft and combining various types of decorative and applied arts has become extremely popular on both sides of the ocean. The idea of artwork as a synthesis between different types of creativity and crafts was the main task of Morris' artistic life. Carried away by the past, he laid the foundation for new art for a new century: Art Nouveau. Modernity spread to many countries, and the idea of "multitangency" and the development of crafts spread throughout Russia by artists and patrons of art. Looking back to the old, William Morris discovered a new path and a breath of fresh air which would leave a colossal imprint in the history of art. La Belle Iseult (1858, Tate Gallery) is Morris' only known easel painting. Previously thought to have been Queen Guenevere, it is now accepted to be Iseult mourning the exile of Tristan. Jane Burden, who was chosen as a model for the pre-Raphaelites for her stunningly unique beauty, married Morris not long after the painting was completed. William Morris, however, seemed to find his painting inadequate, supposedly writing I cannot paint you, but I love you on the back. Burden, however, later had an affair with Rossetti and admitted that she had never truly loved William Morris. Holy Grail tapestries (1891−1894) are a set of six tapestries made collectively by Morris & Co., commissioned by William Knox D’Arcy for Stanmore Hall. The images depict scenes from the Arthurian book Le Morte d’Arthur. William Morris died of tuberculosis October 4, 1896, after having become a well-known poet and socialist activist. 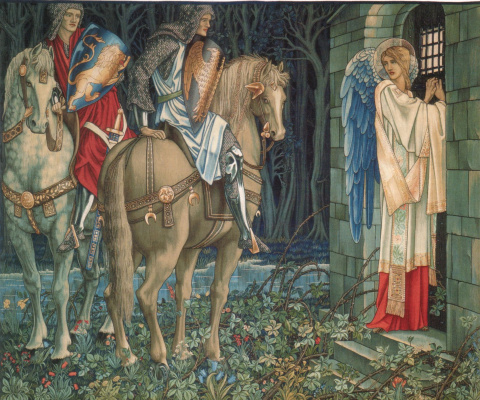 Attributes of His Works: Morris’ creativity was incredibly versatile. He expressed himself in painting, design, and a variety of crafts, which supported his business Morris & Co. The main idea of his work was an appeal to the past, a search for meaning in each image, handmade art, and a disavowal of mechanization. 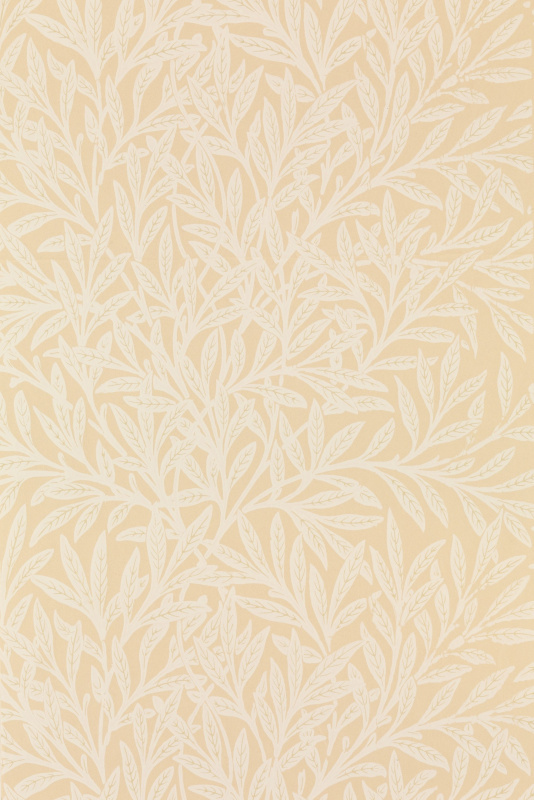 William Morris was born into a wealthy English family in Walthamstow County, which is today a suburb of London. In his childhood, he was attracted to everything manmade and he had many hobbies: fishing, gardening, exploring forests, reading extensively, and admiring the architecture of old churches. He was most of all interested in the Middle Ages and the romance of knightly adventures. William Morris later said that his childhood hobbies and impressions had a big impact on his future life. His studies began in college at Marlborough, a time he later recalled with horror, being ridiculed by his fellow students and finding the lessons very boring. At the same time, he always admired the surrounding monuments of architecture and developed a respect for Anglo-Catholicism. In 1851 he was expelled from school. The next step in his education was Oxford. William Morris was deeply imbued with the culture of the Middle Ages, having been influenced by medievalists, who rejected many current achievements and extolled the past. When choosing a profession, romantic ideas about past centuries and about the church as the center of not only spiritual life, but also education, played a decisive role. William Morris wanted to become a priest, and in the future dreamed of starting a monastery where he could pursue his education and moral improvement. While studying in Oxford, he read the works of John Ruskin, a popular critic in Victorian England. Ruskin strongly condemned contemporary art and art in general, accusing it of mechanization and a lack of a soul and real inspiration. The ideal epoch for him was the time before Raphael, when the artist carried in his works not just earthly beauty, but also spiritual meaning. The works of the English art historian impressed the soon-to-be designer, and he changed his mind and took up art. Ruskin was the ideological bearer of a new art movement for England: the Pre-Raphaelite Brotherhood. Disappointment in the Anglican Church and an understanding of the impossibility of creating an ideal environment for living in spiritual purity and chastity further brought William Morris closer to painting. During his travels, he sought out and studied medieval paintings. Once in London, Morris met Dante Gabriel Rossetti, one of the founders of the Pre-Raphaelite Brotherhood. This meeting was fateful, and he finally realized that his true path was to paint. At the same time, William Morris tried his hand at poetry. Painter and illustrator Edward Bern-Jones spoke positively about his poems, and this was the beginning of Morris's long poetic path. It was a spectacular sign of protest, and the Red House now appears in textbooks on the history of architecture as a turning point in the architecture of England at the end of the 19th century. But still, it was just a sign, and now he had to take action to really make waves. Then William Morris and his associates—artists Rossetti, Edward Bern-Jones, architect Philip Webb and others—decide to create their own workshop for the manufacture of decorative and applied products. It was called Morris, Marshall, Faulkner & Co., "Fine Art Workmen in Painting, Carving, Furniture and the Metals." In their early years, they mostly produced stained glass for churches. Not only the men, but also their spouses worked in the new company. Their hard work and confidence in success helped them cope with the initial difficulties, and after several years the company enjoyed not only great demand, but also began setting trends. With large orders from rich customers and the production and introduction of different types of wallpaper, tapestries, carpets, and ceramics, the life of the workshop became more interesting and productive. The workshop was famous not only for its products, but also for its high prices and expensive materials available to a limited number of connoisseurs. Starting in 1875, production belonged exclusively to Morris, and the company began being called Morris & Co. Over time, he started making items for people with more modest incomes. Thanks to Morris, the traditional British art of textile was revived, and it became a direct part of everyday life again. The company existed until 1940. 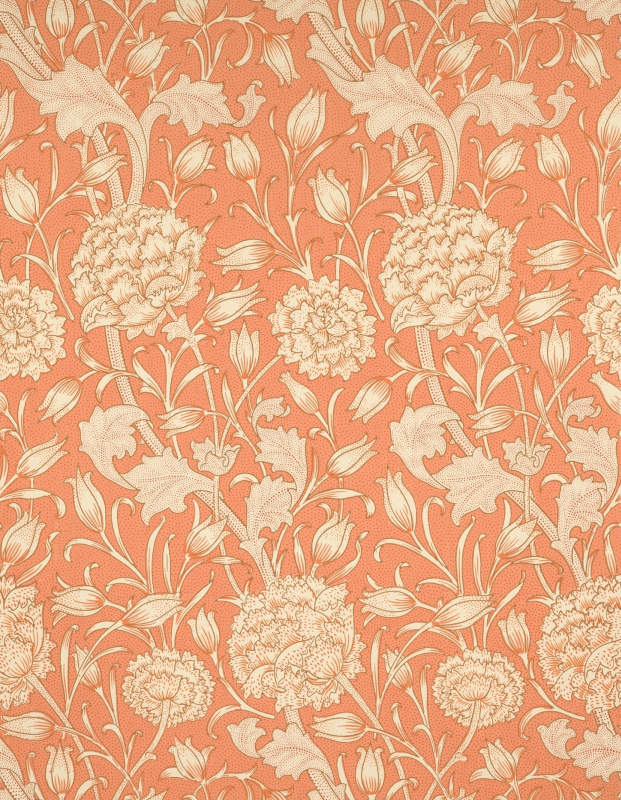 William Morris was a man with a mission. His studio did not just earn him money, but came to life from his hands. Any artist new to his craft studied independently, and he could weave carpets and made natural dyes for fabric. The idea of handicraft and combining various types of decorative and applied arts has become extremely popular on both sides of the ocean. The idea of artwork as a synthesis between different types of creativity and crafts was the main task of Morris’ artistic life. Carried away by the past, he laid the foundation for new art for a new century: Art Nouveau. Modernity spread to many countries, and the idea of "multitangency" and the development of crafts spread throughout Russia by artists and patrons of art. Looking back to the old, William Morris discovered a new path and a breath of fresh air which would leave a colossal imprint in the history of art. 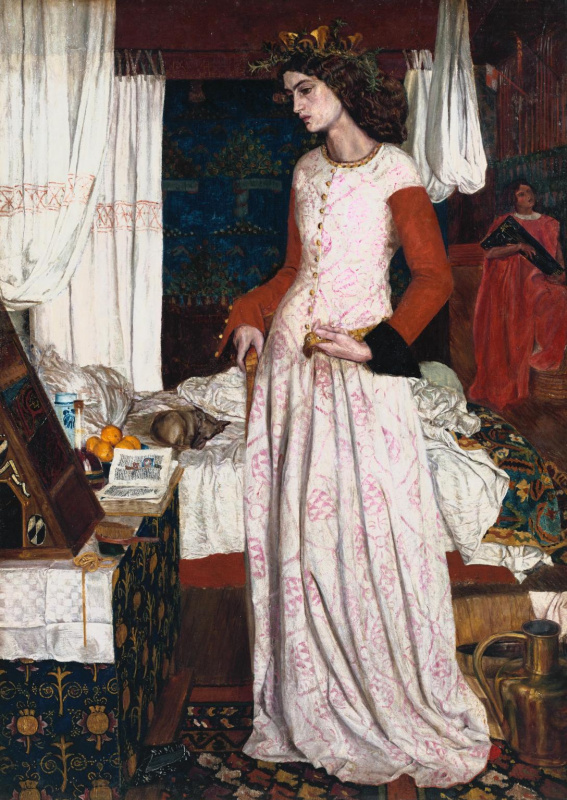 La Belle Iseult (1858, Tate Gallery) is Morris’ only known easel painting. Previously thought to have been Queen Guenevere, it is now accepted to be Iseult mourning the exile of Tristan. Jane Burden, who was chosen as a model for the pre-Raphaelites for her stunningly unique beauty, married Morris not long after the painting was completed. William Morris, however, seemed to find his painting inadequate, supposedly writing I cannot paint you, but I love you on the back. Burden, however, later had an affair with Rossetti and admitted that she had never truly loved William Morris. Holy Grail tapestries (1891–1894) are a set of six tapestries made collectively by Morris & Co., commissioned by William Knox D'Arcy for Stanmore Hall. The images depict scenes from the Arthurian book Le Morte d'Arthur.